Hurricanes coach John Plumtree has named his side to face the Sunwolves in a Super Rugby clash in Tokyo. SA Rugby has dismissed a claim that its push for the Sunwolves' axing from Super Rugby was motivated by getting revenge over Japan. Sunwolves coach Tony Brown believes bad blood between SA and Japan played a part in the Japanese franchise losing its Super Rugby status. Waratahs coach Daryl Gibson has shuffled his starting XV ahead of his side's clash against the Sunwolves in Newcastle. Former Springbok coach Jake White has lauded the decision to scrap the Sunwolves from Super Rugby. The decision to boot the Sunwolves from Super Rugby has sparked concerns about the sport's growth prospects in Asia. Lions captain Malcolm Marx says it will be sad to see the Sunwolves dumped out of Super Rugby at the end of the 2020 season. 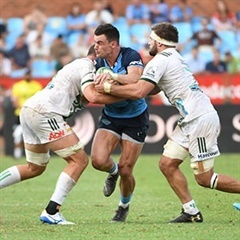 Herman Mostert highlights FIVE talking points after Week 6 of the 2019 Super Rugby competition. The axing of Japan's Sunwolves from Super Rugby will damage efforts to promote the sport in Asia, the team's chief executive has said. The Lions, led by an inspirational performance by skipper Malcolm Marx, were full value for their victory over the Sunwolves in Singapore. Sunwolves CEO Yuji Watase admits he had feared for the team since Super Rugby's ambitious expansion to 18 sides was reversed.